For the last two weekends, both the men’s and women’s crew teams have been hard at work on the water in Massachusetts in preparation for the season-finale rowing championships, the New England Rowing Championships and the ECAC National Invitational Rowing Championship. At a race on the Malden River in Medford, Mass., on Saturday, April 15, the men’s first and second varsity eight defeated the University of New Hampshire, while the men’s third varsity eight came second behind Tufts. At the same event, the women’s first varsity eight was victorious in a duel against Wellesley. The following Saturday, April 22, on Onota Lake in Pittsfield, Mass., the men’s first and second varsity eight defeated Williams in dual races, while the men’s third came up short. In the women’s races, the Cards were less successful; although the first varsity eight took down the Ephs, the second and third varsity eight were just a little slower than what was needed for victory. The next day, the men were back on the water, this time on Lake Quinsigamond. In the first varsity eight, the Dirty Birds raced to third, just behind Holy Cross University and Trinity. The second varsity eight fittingly came in second, while in the varsity four race, the Cards raced two boats, taking second and fourth. 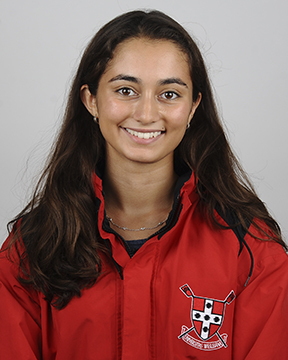 Following these races, The Argus sat down with Antonia Bascombe ’20 and discussed all things crew. The Argus: What’s your position on the crew team? Antonia Bascombe: Currently, I’m on the second boat. I am a coxswain for the second boat, but those [positions] are pretty tentative right now. We don’t have completely set lineups, that’s pretty much a changing thing until New Englands and ECACs, and boat rhythm can change and we’re always just looking for our fastest crews, and that includes just a combination of people and that can switch week to week. A: Can female coxswains be on both the men’s and women’s team? AB: We have men’s coxswains who are also women and for the women’s team, we have our coxswains, but we did have, earlier in the fall, a few coxswains [who] would cox for the men in practice because we only have three boats and four coxswains, so if the men were taking out more boats and they needed an extra coxswain, we could switch back and forth. But on race day when it comes down to it, team to team, we have specific women’s coxswains and then the men’s coxswains. A: I interviewed Sam Pratt [’19] and he talked about how each of the boats are like a family, have their own identity. Would you say that’s very true for the women’s teams as well? AB: Yes, I would say that’s true as well. Each boat—it’s nine people—you spend a lot of time together and within that boat, the rowers and the coxswain have a mutual understanding of each other because when you’re coming down the course, you’re trusting that everyone is putting their best foot forward, and everyone is pulling their hardest and your coxswain’s gonna get you through that line and tell you what needs to be done and when. So there’s a lot of trust that goes into that, and therefore it’s like a family almost. I agree with Sam with that. A: What exactly is the training regime for you as a coxswain, as well as the rowers on the boats? AB: Day to day at practice, coxswains, we kind of act not as the coach of our boat, but we’re kind of the liaison between the coaches and the rowers because the coach isn’t in the boat with you, so your coxswain tells the rowers exactly what to do. Like if we’re taking the boats out of the boathouse, the coxswain will tell you when to put hands on, when to pick it up, when to put it on your shoulders, when to walk forward, when to stop. Coxswains have pretty much total control over what the rowers do—the rowers don’t row until we tell them to row, and we’re also there to help find rhythm and keep everyone on the same beat doing the same thing cohesively. We also strategize; we have a race plan, but races change. Race to race, a crew could be up on you when usually they’re down, and that’s when it’s up to the coxswain’s discretion on when to call a move to move up on them. So we are like the eyes of the boat because the rowers are rowing backwards. A: When you say call a move, is that just, say, increasing the tempo? AB: It could change, so towards the end of our race we have a sprint, so that’s up in tempo, up in stroke rating, up in power, and it could also be a designated ten to swing better, or to have more rhythm or more tempo out of bow, just to pick up boat speed. Usually, moves won’t increase the rating, it’s just to have a purpose, for those ten strokes, whether it’s to get one seat on that boat, whether it’s to get two seats, whether it’s just to slow the slides and cut down the rush. Whatever it is, it’s just a concentrated ten. A: I was looking at the notes of the results, and it said that the Williams team caught two crabs. How often do boats mess up and get their oars stuck in the water? AB: You can’t really put a number on that or how often it would be—it varies race to race, it could depend on the water that day. If it’s super choppy, it’s a lot easier to catch a crab as your blade could get stuck, or like someone could jump their slide and fall off their seat. Anything can happen usually, and in racing we usually have a one-minute rule, where if there’s any breakage or anything like that you have within the first minute of the race, you can restart the race. But crabs are different. It’s on that rower who caught the crab, so it’s not an unusual thing, but it doesn’t happen regularly. I don’t think anybody goes into a race expecting a crew to catch a crab. A: What is the most challenging part of being a coxswain? AB: I think the most challenging part of being a coxswain is everything is under your control, but at the same time you physically cannot make a rower pull harder. You can tell them to do it, but it’s up to them to trust you, and say, well, if my coxswain’s telling me to do it, I’m gonna do it. So establishing that relationship and just having your crew trust you and having to call those moves, per se, it’s up to my discretion to do that. Probably the most challenging thing is just having all of that on your shoulders. Everything they do is because we told them to do it. A: Given the amount of time you put into rowing, how emotionally taxing is it on you personally? AB: I’d say I’m very emotionally involved, and I would say it’s the same as the rower. Even though I’m not physically pulling in the boat, I’m there and with them through it, so when we lose I’m really upset and when we win and we’re high off that win, I’m really happy with them too. It can be frustrating at times when your boat just doesn’t move cohesively no matter all the things that you say or do, and it’s the same way the coaches would get frustrated as well. A: What has been your favorite crew experience from your time at Wesleyan? AB: I think, for me, my favorite crew experience so far has been on our training trip in Florida this past spring break. We were in mixed boats, mixed lineups, which means that girls that are in the 1V or 2V are mixed together, so half of the 1V is in one boat and the other half is in the other, and same with the 2V, so they’re pretty much equal, and just rowing together and having that swing. We were pulling a couple five hundred meter pieces down in Florida, and everyone was super happy, and everyone was just pulling their hardest against each other because it’s fun to race against people that are in your own boat, and that was really fun. Everyone just came down as hard as they could, but people were having fun, there was no stress involved. That was my favorite rowing experience.